✿ If you want a profile pic, I will be taking some requests! ✿ I will be making some Pluff games as well! 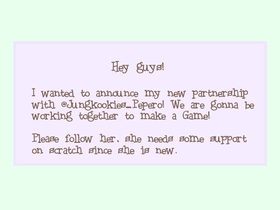 ✿ Shoutouts: @Jungkookies_Pepero @PLAZLORD AND I FOUND A COOL NEW SCRATCHER: @-pokki- EVERONE GO FOLLOW HER! !